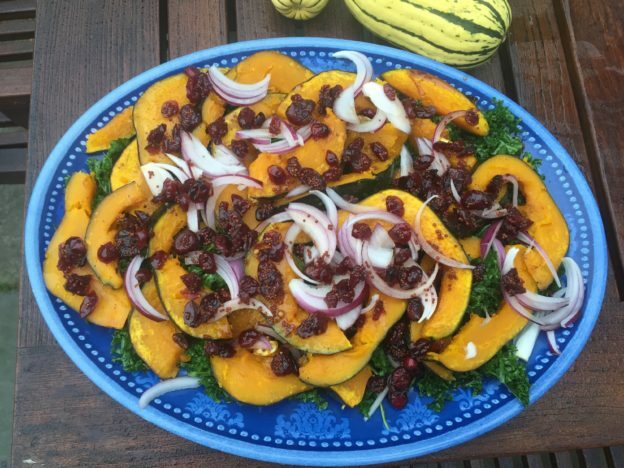 Roasted Squash, Kale and Cranberry Salad - Bring It! Your timing is impeccable! I am bringing dinner to a family on Monday, and the request was for “something with beautiful squash in it.” And kale salad is my go-to, so I just needed this inspiration to marry the two. Thank you! Oh good! I think you’ll really like it. I ended up using a much higher squash to kale ratio, because I am a squash glutton. But you know your people–and you sure as heck know your kale—so however you roll it’ll be great. Thanks for reading! OMG this looks amazing. What a great combination. It is pretty delish. Thanks for reading and I hope you like it. It’s become a real go to for me!